Itanagar, February 9: To the land of rising sun, Arunachal Pradesh is not just blessed with abundant beauty but also with escalating development stature. Inaugurating various development projects, Prime Minister Narendra Modi, laid foundation stone of many vital schemes worth over Rs 4,000 crore for Arunachal Pradesh. Along with it, PM Modi laid the foundation stone for construction of greenfield Airport at Hollongi and inaugurated a retrofitted airport at Tezu in Lohit district through a remote. He inaugurated the new Doordarshan channel for Arunachal Pradesh, DD Arun Prabha. Addressing the rally PM Modi said that the dream of building New India will only be possible when the North East will be developed well. 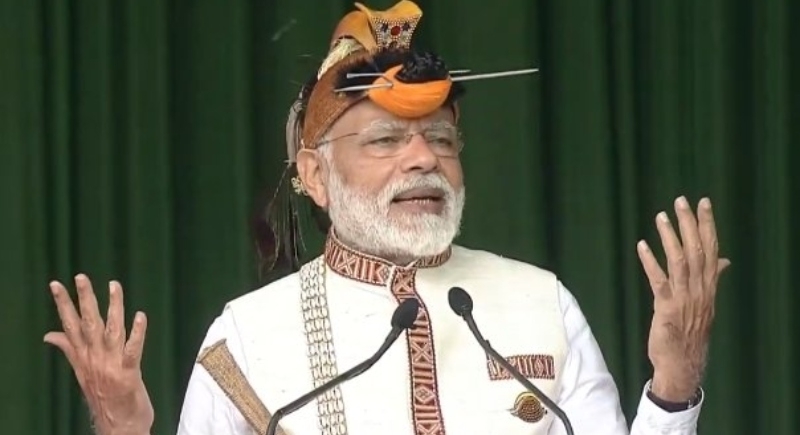 Inaugurating the retrofitted airport at Tezu in Lohit district through a remote, PM Modi said that the Tezu airport was built over 50 years but no govt envisioned to connect people of this state with other parts of the country. The BJP government expanded the airport by spending around Rs 125 crore. In the last two years, around 1000 villages have been connected through roads. The work of Trans Arunachal highway is also under progress. In an effort to connect all the capitals of North East states, Itanagar has also been connected with the Railways. Emphasising and focusing on power generation, Prime Minister also dedicated to the nation the 110 MW Pare Hydroelectric Plant to Arunachal Pradesh. He also laid the foundation stone for a permanent campus of Film and Television Institute of India (FTII) at Jote. Taking a dig at the opposition, PM Modi said that the previous governments neglected this state for decades despite the availability of natural resources needed for development and its strategic importance. The NDA government is here for a change and New India can only be built if Northeast can be developed well.